There's a reason flowers are a constant in home decor: they're classic yet adaptable. You have traditional flowers, modern flowers, minimal flowers, contemporary flowers, eclectic flowers; in short, there's a flower for every decor style. Floral design brings organic freshness that's difficult to imitate. A floral bathroom instantly has that elegant feel, and it's also full of personality. It's also easy to choose a nice floral wallpaper to guide your color decisions. Just match your paint and other colored accessories to the shades of the floral pattern, and you have an easy-made, no-fail color palette. 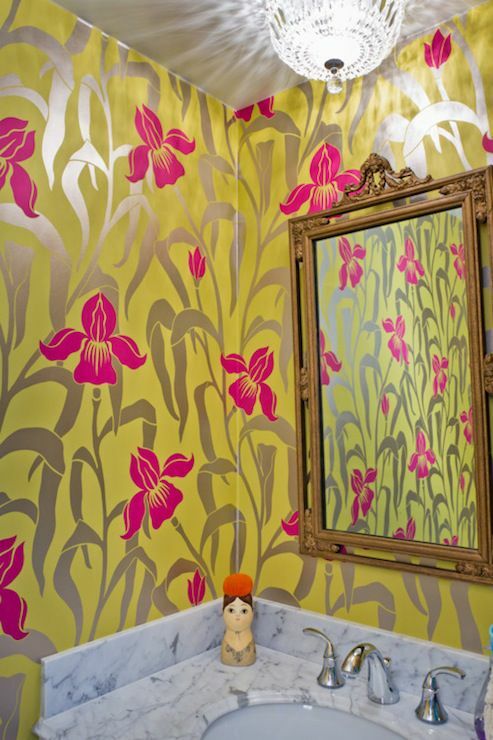 This bathroom by House of Honey goes bold with bright fuschia irises with silver stems on a yellow background. It's the perfect choice for a person who likes to be a little more daring in their decor choices. 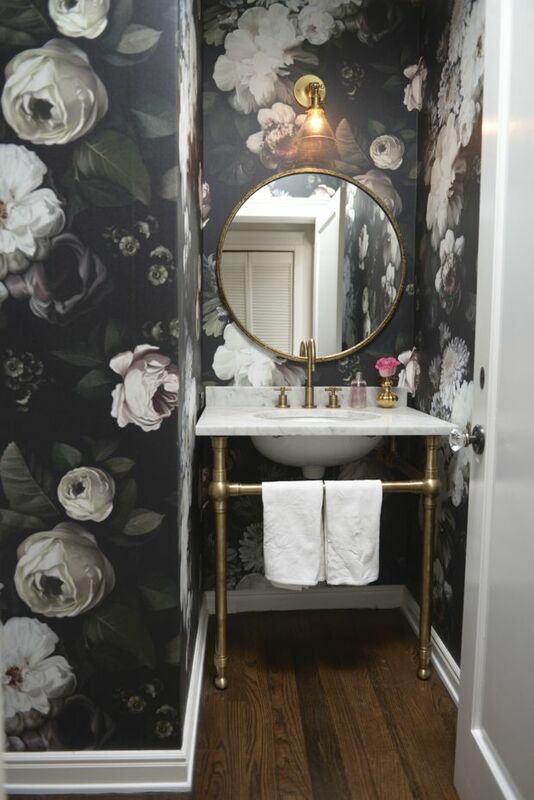 This powder room by Emily of cupcakes and cashmere went from blah to wow with the addition of this bold, large-scale floral wallpaper pattern. The enlarged flower pattern makes you feel a little like Alice after she's shrunk down to a few inches. This wallpaper may also convince you that black isn't always bad, even in small powder rooms like this one. The white moldings and the pastel flowers provide just enough brightness to counter the oppressive effect of dark colors. This sweet powder blue wallpaper, in a design by Finnian's Moon, is meant for a girl's bathroom, but could just as easily be used for an adult. The hand-drawn floral pattern has tons of interesting colors you could use elsewhere. The yellow could guide your choice for accessories or even the paint on the vanity. Towels in a mix of yellow and darker blue would add some coordinated shades to the whole. If your tastes are less traditional, have a look at current wallpaper designers. This whimsical birds, butterflies and flowers pattern by Schumacher is used in a bright white bathroom designed by Taylor Jacobson to give you the feel of a sunny, fairy-like meadow. The marble subway tile on the bottom half of the wall gives a subtle support to the wallpaper by bringing more gray and white. This elegant space is feminine while not relying on typical pink or blue to achieve this effect. Here the floral effect is used more as a subtle enhancement than the major decor element. In fact, in this bathroom by Suellen Gregory, the ornate mirror is the focus; the wallpaper only gives it a nice background to shine from. This wallpaper pattern is best for those who want more than a bare paint for their walls but still don't want the full-on floral effect. The neutral, faded colors make it easy to coordinate with ivory accessories and fixtures. Who says flowers have to be the typical ones we see in North America and Europe? Sometimes floral means tropical, as in this gorgeous dark and leafy wallpaper in a laundry room by sfgirlbybay. The wicker and copper accessories on the shelves really bring out the coral elements in the wallpaper. Also, adding a real plant with palm-like leaves ends up being the perfect final touch. This Sims Hilditch design features a grey and blue floral wallpaper with matching shipslap wall covering. Because of the match in shades, the wallpaper doesn't pop out; instead, it harmonizes with the rest of the space and brings a soft touch of organic freshness. A freestanding tub with modern lines tells us that this bathroom, although very traditional in design, is still grounded in the 21st century. Sophisticated, feminine and subtle: these are some of the ways you could describe this gorgeous bathroom by Coddington Design. The large ivory flower blooms stand out just enough against the neutral pink shade to bring a sense of delicate movement to the whole. Chrome clawfeet and a modern side table with chrome legs finish the look, for something retro yet somehow oh so very contemporary. This floral/animal wallpaper is inspired by the art of the Otomi people of Mexico. In a gorgeous turquoise, it's the perfect companion to a bathroom that uses natural wood and whitewashed furniture, as in this bathroom by Wit and Delight. Because it is a rather busy pattern, you might want to keep it to only a small section of the bathroom and complement with neutral and white, avoiding other colors. If you're worried about floral patterns being too feminine, this bathroom by Stephani Buchman features an ingenious solution: using flowers as part of a geometric pattern with more masculine tendencies. Because the flowers are more abstract, rather than a representation of real flowers, they are less likely to be seen as "dainty" or overly girly. In fact, this is a fairly strong pattern that suits a master or a guest bathroom. We've seen a lot of large floral patterns so far, and they are quite popular right now. This powder room, via Lonny, appears rather busy at first glance, but once you let your eyes settle, you will see how the floating marble countertop melts into the background, and how the sunburst light fixture gives the whole the sense that you found your way into a secret garden with its own sun. Not for everyone, but certainly a bold look. Speaking of bold, this retro-chic bathroom by Summer Thornton Design is also certain to make its mark in your memory. The painted floor in white, green and black stripes contrasts with the delicate floral pattern in metallic tones, bringing an intriguing space together nonetheless. Gold accents on the tub clawfeet and hardware harmonize with the wallpaper, while a clear lucite shelf holds all the bath necessities without getting in the way of the visuals.